Doug Kingsmore Stadium, the home of Tiger baseball since 1970, has seen many changes and improvements over the years, but it has not lost its aesthetic beauty and unique feel on the west side of the Clemson University campus. Clemson was No. 9 in the country and No. 1 in the ACC in average attendance (4,664) in 2016. It marked the Tigers’ 23rd straight top-20 finish and 15th season in a row in the top 10 in the nation. Thanks in large part to that fan support, StadiumJourney.com rated Doug Kingsmore Stadium as having one of the top-10 stadium experiences in the nation in 2015. This outstanding fan support from the Clemson community and upstate of South Carolina has contributed to the Tigers’ outstanding home-field record. 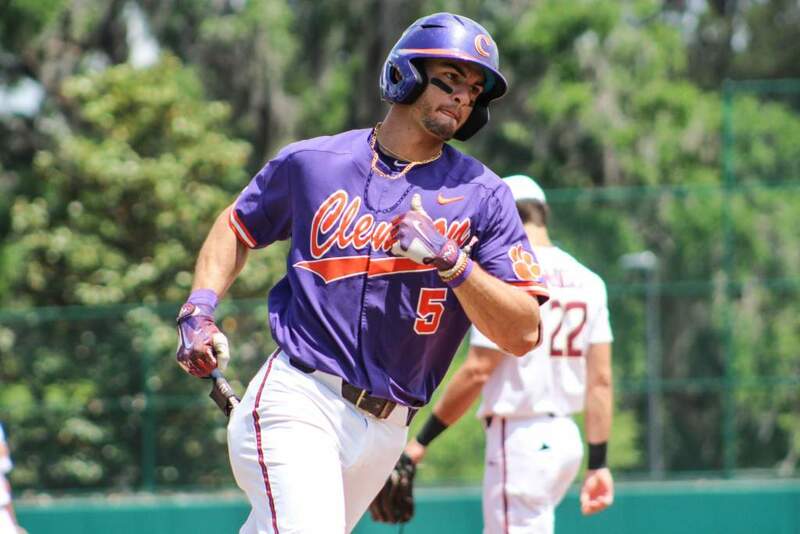 Clemson has played at Doug Kingsmore Stadium for 47 years and has a winning percentage of 79 percent. That includes a 379-119 record (.761) in ACC regular-season contests. The Tigers have had a winning record in all 47 seasons at Doug Kingsmore Stadium as well. 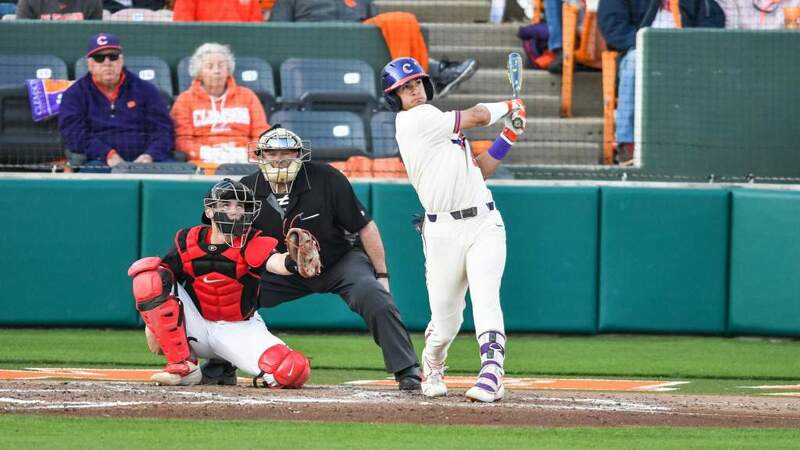 Nine times during the 1994 season, an opposing top-20 team tasted defeat at Doug Kingsmore Stadium, and four times a team ranked in the top three lost to the Tigers. Seven wins against top-20 teams, including three victories over a top-10 Florida State squad, were recorded at home in the 1996 season. In 2000, the Tigers had an 8-3 record against top-25 foes at home. After Clemson won three games against No. 2 Florida State, head coach Mike Martin opined on how tough it is to play at Doug Kingsmore Stadium. Martin echoed those sentiments 12 years later after his top-ranked Seminoles salvaged the series with their only win in the series in the finale at Doug Kingsmore Stadium in 2012. Doug Kingsmore Stadium has seen steady improvement since its first season in 1970 and is now one of the top facilities in the country. Evidence of its high rating among facilities across the nation has been demonstrated in recent years, when Doug Kingsmore Stadium was named as a site for a regional and/or a super regional in 1994, 1995, 1996, 1998, 2000, 2001, 2002, 2005, 2006, 2009, 2010, 2011 and 2016. The renovations began during the summer of 2002, which has kept Clemson’s ballpark among the country’s best. The stadium has a brick façade that surrounds every entrance. A green roof that covers much more of the stands and a press box that is twice as large adds to the comfort of fans attending the game and the media covering it. The press box, which is accessible by elevator, includes four large booths for broadcasting and a separate media center that accommodates 18 writers. There is also a patio area outside the press box that is above the existing stands along the first and third-base lines. The area is used for receptions and other events. Two ticket booths, concession stands with an adjoining picnic area and enlarged restrooms make the facility easily accessible and fan-friendly. A grand stairway leading from the McFadden Building parking lot to the stadium’s main entrance is an added feature from a convenience and aesthetic aspect. The players also realize improvements, as four batting cages were constructed beyond the right-field fence. The dugouts were almost doubled in length and width. Prior to the 2005 season, PawVision, the videoboard that was used in the football stadium, was moved to Doug Kingsmore Stadium. Prior to the 2008 season, new lights were installed, then a practice facility with field turf was built behind the batting cages in 2009. Additional chairback seats were also added behind the right-field fence. Before the 2010 season, the Thomas F. Chapman Grandstands were constructed behind the left-field fence, adding 1,000 seats. 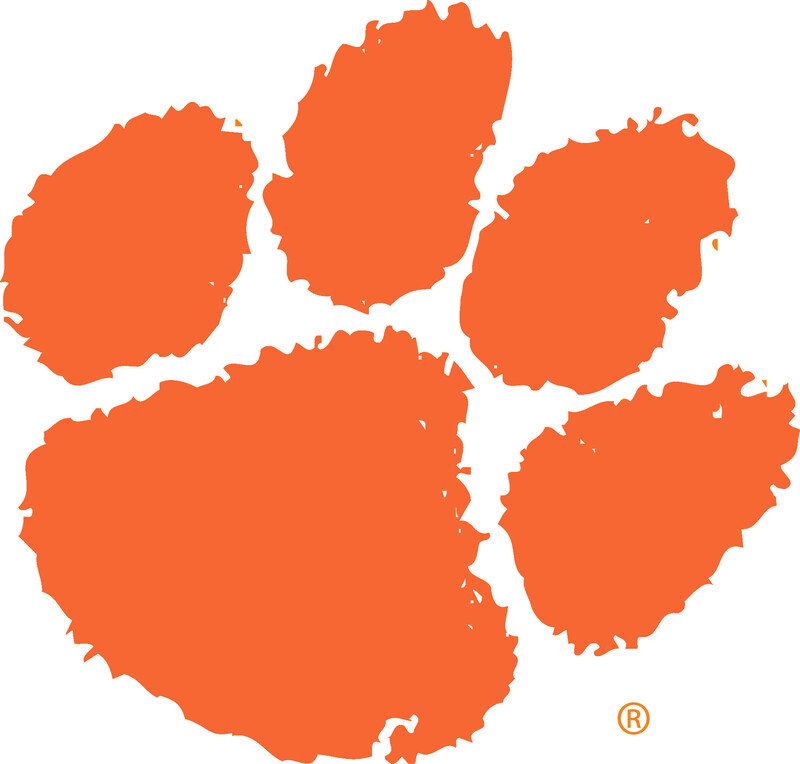 Chapman, who was a two-time All-ACC pitcher at Clemson (1963-65), gave $2 million to the University, $1 million of which went to the grandstands. Before the 2013 season, chairback seats were added in the main grandstand, replacing the bleacher seats. The videoboard was upgraded as well. After the 2013 season, the playing surfaced was re-leveled and an upgraded drainage system was installed that can handle multiple inches of rain per hour without pooling of water. Home plate was also moved out 10 feet, creating more space behind home plate and shorter distances to the outfield fence. In 2015, the stadium continued with upgrades, including a new three-story building behind the first-base dugout. It houses a state-of-the-art clubhouse, coaches offices and a player lounge among other amenities. Premium seating was also added behind home plate. A year later, a berm was created behind the third-base stands and is a favorite among young Tiger fans. The stadium is located in the middle of Clemson’s athletic facilities. It is across the street from Littlejohn Coliseum, home of Tiger basketball, and Memorial Stadium, home of Clemson football. It is also located behind Jervey Athletic Center, home of the administration. Doug Kingsmore Stadium has over 4,500 permanent seats, but is capable of holding 6,272 fans thanks to a hill area down the left-field line that is popular with the Clemson student-body. The stadium attendance record was set on March 6, 2016, when 6,524 fans saw Clemson defeat No. 18 South Carolina 4-1. The park features a terrace in the outfield adjacent to the fence, similar to the old Crosley Field in Cincinnati, Ohio, which ironically was torn down the year Doug Kingsmore Stadium was built. Bill Wilhelm, Clemson’s longtime coach who was the skipper when the field was built, liked the look and practicality of a field with grass all the way around the outfield instead of gravel or dirt. 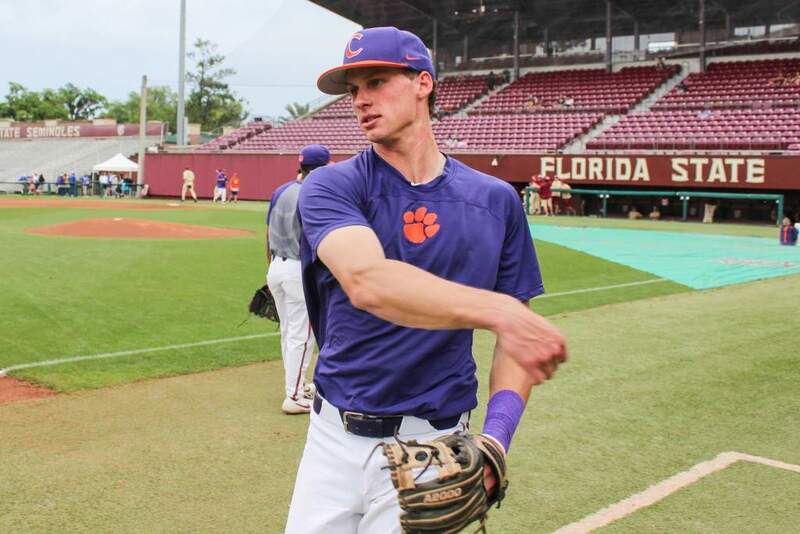 Former Clemson baseball star and Board of Trustees Emeritus Doug Kingsmore gave the athletic department a $1 million gift towards renovation of Clemson’s baseball stadium, formerly known as Tiger Field. During the 2002 and 2003 offseasons, Doug Kingsmore Stadium underwent radical renovations, as over $5 million was spent. Since then, many other renovations have been performed to keep Doug Kingsmore Stadium among the best in the country. D1Baseball tabbed it as the No. 6 ballpark in the country and No. 1 in the ACC in September 2016. Kingsmore played for the Tigers for three seasons (1952-54). An All-ACC and All-District III outfielder in 1954, he became the first Tiger in history to hit 10 home runs in a season. He did that in 1954 while playing just 24 games. He led the ACC in home runs and runs (25) that year, and he led the Tigers in batting average (.371), slugging percentage (.742) and RBIs (27). Kingsmore played three years of professional baseball in the Baltimore Oriole organization before beginning a successful business career. He served three terms on the Clemson University Board of Trustees and became trustee emeritus when his elected term expired in 2002. Atlanta resident Thomas F. Chapman, retired chairman and CEO of Equifax, Inc., gave Clemson University $2 million to form a leadership program in the College of Business & Behavioral Science and to expand and enhance Doug Kingsmore Stadium. One-million dollars of the gift supports the Thomas F. Chapman Leadership Scholars Program and $1 million was used to build the Thomas F. Chapman Grandstands, adding 1,000 seats to Clemson’s baseball stadium. Chapman graduated from Clemson with an economics degree in 1965. While at Clemson, he was a two-time All-ACC pitcher, including a first-team selection in 1965 when he led the ACC in strikeouts (100). 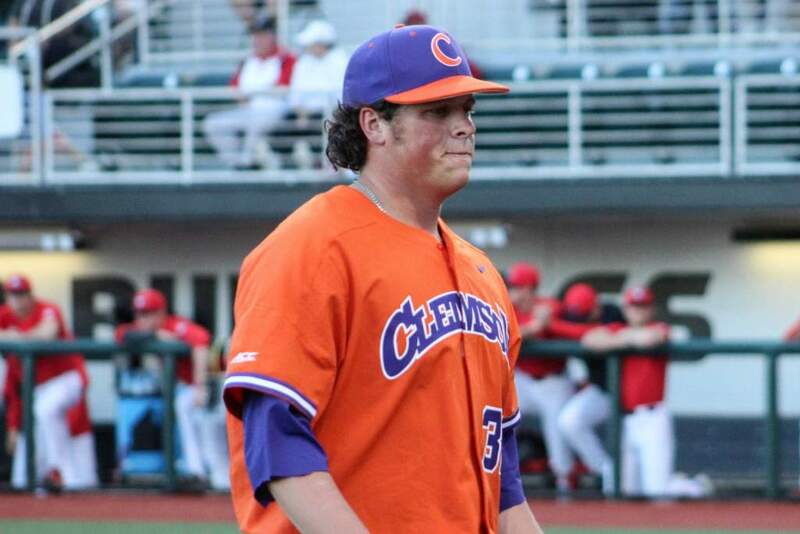 In his three years in a Tiger uniform, he had a 12-7 record and 3.12 ERA. Upon graduation, he became the first Tiger to be selected in the major league draft when he was taken by the Philadelphia Phillies in 1965. He played professional baseball until April 1968, when he was called to active military service.